Evernote makes it easy to remember things big and small from your notable life using your computer, phone, and the web. Get started today with a free account. 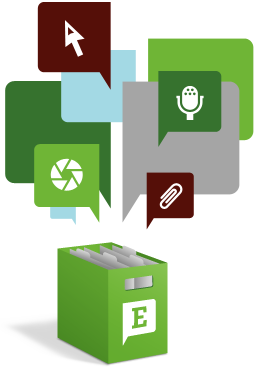 Chances are, if you can see it or think of it, Evernote can help you remember it. Type a text note. Clip a web page. Snap a photo. Grab a screenshot. Evernote will keep it all safe. Everything you capture is automatically processed, indexed, and made searchable. ...... one place. Use Evernote for work, for play, and for everything that's noteworthy. * Snap a photo of a business card with your phone, and have an easy way to store and access contacts. * Capture plane tickets and confirmation numbers, hotel invoices, and receipts for your expense reports. * Get inspired. Keep a file of anything cool you want to buy for yourself or as a gift, whether it's online or out in the real world. * Keep notes from your meetings all in one place. Take a picture of a whiteboard and you'll be able to find it later. * Plan your next trip. Clip web pages, maps, and itineraries. Capture sights, sounds, tastes, and anything else. * Research web sites and clip pages directly from your browser. * Keep a record of your favorite wines by snapping a photo of the label when you find one you like. * Remember the things you were supposed to remember. Create to-do lists, jot down random thoughts, leave a voice memo, and more. Qweas is providing links to Evernote for Windows 4.5.7.7146 as a courtesy, and makes no representations regarding Evernote for Windows or any other applications or any information related thereto. Any questions, complaints or claims regarding this application Evernote for Windows 4.5.7.7146 must be directed to the appropriate software vendor. You may click the publisher link of Evernote for Windows on the top of this page to get more details about the vendor.